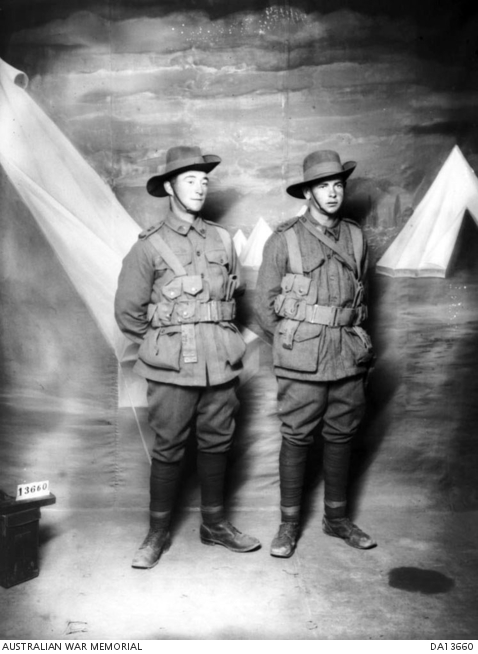 Studio portrait probably of 6293 Private (Pte) Gilbert Pearce, 20th Reinforcements, 1st Battalion, of Leichhardt, NSW and an unidentified soldier. Pte Pearce enlisted on 20 March 1916 and embarked aboard HMAT Euripides on 9 September 1916. On 5 May 1917 he was reported missing and on 8 May 1917 reported killed in action at Bullecourt in France.